Confusion about sunscreen and sun exposure put a lot of kids at risk for getting a sunburn. Review these answers to common sunscreen questions parents have, such as when to reapply sunscreen, whether you should use a combination sunscreen and insect repellent, and if your kids can get a sunburn on a cloudy day so that your kids are protected from the sun. How much sunscreen do I need to use on my kids? Many experts report that most people don't use enough sunscreen on their kids. A larger child may need a little more and an adult would need about double. The American Academy of Pediatrics recommends using an ounce of sunscreen for a young adult. Another good general rule is to use a palmful of sunscreen to cover your child's body. Since larger kids have larger hands, that helps you adjust the amount of sunscreen for different-size kids. Do you need to use sunscreen if you have dark skin? Yes, everyone should use a broad-spectrum sunscreen with an SPF of at least 15 to 30 all of the time when they are going to be out in the sun. 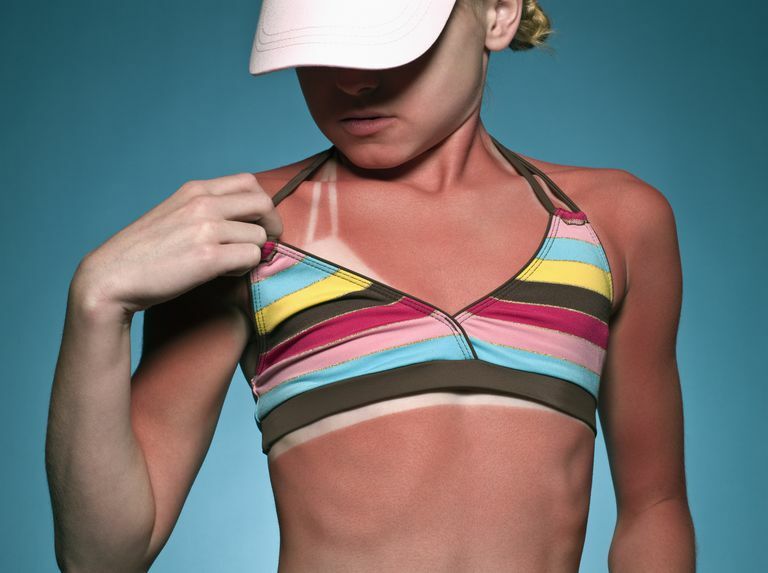 Even people with deeply pigmented skin, who rarely burn, should use sunscreen. So use sunscreen, no matter your race or ethnic origin, because it is a myth that people with dark skin don't need sunscreen. Is it ever healthy to get a tan? No, there is no such thing as a healthy tan. And a 'base tan' is not a substitute for sunscreen either. A tan from artificial light, like a tanning bed, isn't healthy either and may raise a person's risk of melanoma. Not surprisingly, the American Academy of Pediatrics opposes the use of tanning salons by children under the age of 21. Will going out in the sun without sunscreen to get a tan make your teen's acne go away? Acne is a fact of life for many teens and most will do anything to make themselves look better. Getting a tan isn't one of the things they should be doing, though. A tan may make their pimples look better temporarily, but the damage the sun exposure does to their skin and pores will just cause an even larger breakout a few weeks later. Your pediatrician and/or a pediatric dermatologist can offer much healthier ways to control your teen's acne and recommend a non-comedogenic sunscreen too. What does SPF on my sunscreen's label stand for? SPF is an acronym for sun protection factor. Do you have to reapply sunscreen if it says that it is 'waterproof' or that it has 'all day protection'? Yes, no sunscreen is truly waterproof. Instead, it can be water resistant and may need to be reapplied every few hours or according to the manufacturer's instructions. And no sunscreen really provides all-day protection. Even with an SPF of 50+, you should still reapply it every 2 hours, or sooner if you have been in the water or sweating a lot. Does using a sunscreen or sunblock block your body's ability to make vitamin D from sun exposure? Yes, and while some experts use that fact to recommend unprotected sun exposure, if your child is following nutrition guidelines for drinking milk, then she should be getting enough vitamin D.
Talk to your pediatrician if you think your child needs more vitamin D, especially if he doesn't drink milk, has very dark skin, and/or is rarely in the sun. Does a sunscreen with an SPF of 30 provides twice the protection as one that has an SPF of 15? No. A sunscreen with an SPF of 15 provides protection against 93% of UVB rays, while one with an SPF of 30 provides 97% protection. Keep in mind that a sunscreen with an SPF of 2 only provides 50% protection, so be sure to use a sunscreen with an SPF of at least 15 to 30. Many experts question whether using a sunscreen with an SPF above 30 is really necessary since you are already blocking 97% of UVB rays. Using a high SPF sunscreen might provide more protection for those parents who don't use enough sunscreen and don't reapply it often enough though. When should you apply sunscreen on your kids? You should apply your sunscreen 15 to 30 minutes before you are going to be exposed to the sun. Since it takes time for the sunscreen to be absorbed by your skin, you should apply it in advance. If you wait until you are already outside or until your child shows signs of getting red, then he will have a longer period of being unprotected and will be more at risk for getting a sunburn. Do a combination sunscreen and insect repellent provide good protection against both the sun and insect bites and stings? While you can use a combination product to protect your children against both the sun and bugs, it is not usually a good idea. Remember that you should reapply sunscreen every few hours, while you usually don't reapply an insect repellent very often, or at all. Also, most experts think that insect repellents lower the SPF of sunscreens. So while a combo product might be convenient and provide protection, it likely doesn't provide good protection, unless your child is only going to be outside for a few hours. Clouds don't block the UV rays that cause sunburn, so you can still get a sunburn when it is cloudy outside. Since UV rays can be reflected off of water, sand, snow, and concrete, you can even get a sunburn in the shade. CDC. Insect Repellent Use and Safety. August 3, 2005. FDA. Indoor Tanning: The Risks of Ultraviolet Rays. May 2010. Which SPF Is Going to Protect You and Your Kids From Sunburn?